2012 saw a rise in net company growth for the third year running in Winchester, according to figures in the recently-released Duport Business Confidence Report. 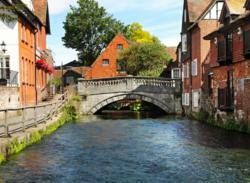 Last year the company register in Winchester increased by 251, representing growth of 44%. 2012 was the third year running in which net company growth rose in the city, after a slump to minus 19 at the height of the recession in 2009. However, company formation actually fell slightly over the course of the year, from 561 in 2011, to 558 in 2012. The local authority runs a range of schemes to help encourage new business in the city. These include a “Meet the Buyers” day, which last year generated £6.25 million in deals during one day. There are also free business seminars available and a Micro-Business Development Grant Pilot Scheme, which is a one-off payment to help support and develop small business. “Winchester is a charming place with great links to central London and an affluent population - all things which should help buoy the local economy in these difficult times. The Duport Business Confidence Report for Winchester provides accurate data that can be used to gain an insight into the local business economy. More information and statistics can be found at http://www.duport.co.uk/winchester.